I was recently thinking back to last year’s ODI Belfast unConference where someone mentioned one of the smallest (and, by implication, the least useful) datasets available on their website [here] – the list of 22 Bowling Pavilions in Belfast City. The question was ‘what can you possibly do with a list of 22 bowling pavilions?’ I seem to remember the suggestion that they might be useful in the event of a Zombie Apocalypse where they could be put to use as holding centres for the contaminated. I’m not a huge fan of the Zombie genre, but even I know that this approach will not end well. So … what do you do with a list of 22 Bowling Pavilions? This is a question that has been ticking away in the back of my head for a while now (wow … I really don’t have the richest internal life, do I?) … how do you use this kind of data in a useful way? Sure … I can build you a dashboard that shows all of their locations … but how is this of any use to anyone? As I’ve scoured the ODI website looking for interesting datasets to work with, I’ve noticed several of these relatively small lists and, again, thought ‘what can you do with this?’ It eventually occurred that I was looking at this kinda’ the wrong way – these lists may have relatively little value on their own, but they might have quite a bit more significance if they were all brought together. My first instinct was to omit the datasets from everywhere outside Belfast and weed out the NI-level ones to the same end. Although this would have left a very neat Belfast-only dataset, I was reluctant to go that direction for two reasons. Firstly, Belfast is frequently privileged above the rest of Northern Ireland and it wasn’t something I wanted to perpetuate if there was data (however patchy) that could be used to address the balance. The second reason is the explicit idea of the ODI case studies series – to not just show off the Open Data available and how it can be used, but to impress on key stakeholders that their data is relevant, useful and should be made available. Here, the blanks on the map serve the purpose of showing areas of Northern Ireland where data on public utilities is missing, but would be of particular use. What had to be done to the data? Not all data is created equal, even when it originates within the same organisation. Tableau only uses location data in the format of digital degrees and I wanted the map to filter on the first part of the postcode, so it was inevitable that some work would be necessary. For example, some datasets were presented with only Irish Grid co-ordinates. In these cases I used a batch co-ordinate converter created by Barry Hunter [here] to translate the data to digital latitude and longitude. These datasets include: Air Quality Monitoring Stations; Fermanagh & Tyrone Bowling Pavilions; Fermanagh Community Centres; Libraries; Recycling Centres; Train Stations. Other datasets came without any form of UK postcode and I used Chris Bell’s fantastic Batch Reverse Geocoding tool [here]. 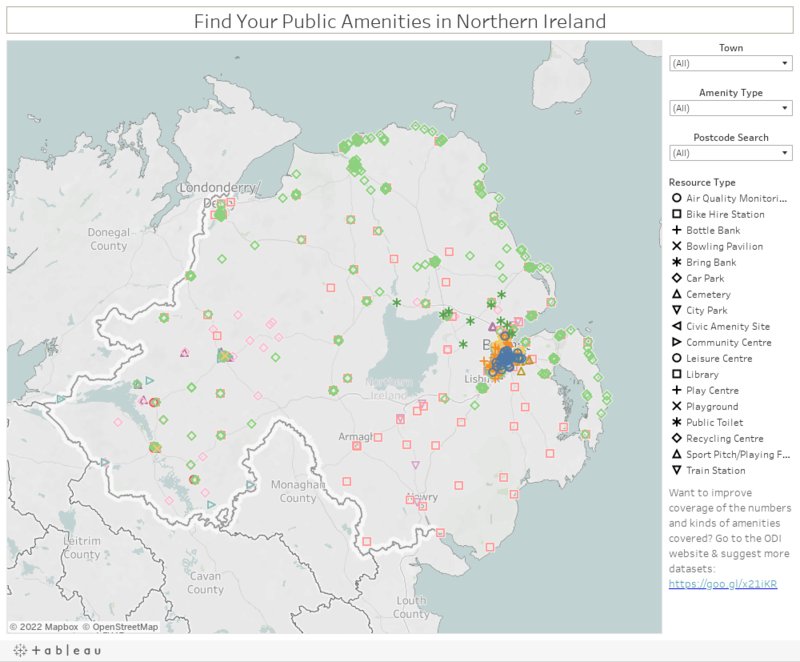 These datasets included: Air Quality Monitoring Stations; Bike Hire Stations; Belfast Bowling Pavilions; Public Toilets; Sport Pitches and Playing Fields; Train Stations. Two of the Playing Fields could not be easily assigned a postcode by this method, but a little strategic Googling soon provided an answer. It would be churlish not to note that most datasets were perfect for my needs and required no further manipulation. These included: Bottle Banks; Car parks; Cemeteries; City Parks; Civic Amenity Sites; Belfast Community Centres; Play Centres; Playgrounds. Overall, I’d urge any organisation considering making their data available to the ODI (or anyone else) to strive to offer the maximum amount of detail in terms of location – full postcodes, grid co-ordinates, and latitude and longitude. As different users and technologies will have varying needs and plans for the data, increasing its usability can only be a good thing. What’s not in the dataset? Once the data has been wrangled into submission, creating a visualisation in Tableau is straightforward. All it requires is a map with filters for 16 utility types; 90 cities, towns, and villages; and 85 shortened postcodes. From the Tableau side, I was keen to try out the device specific layouts functionality that came with Tableau 10.0. To this end, I designed three distinct versions of the dashboard: for PCs, for tablets, and for smart phones. To say that this didn’t work out well is an understatement … at least at first. The tablet version worked on my Kindle Fire, but it was also the version that appeared on my laptop. True, it still worked … just not the way I wanted it to. The worst one was the smart phone design … every time I opened a filter it took up the entirety of the screen and refused to close once I’d made my selection. This issue was fixed by adding an ‘apply changes’ button that also closed the filter. The Laptop/Desktop issue is a bit trickier and appears to revolve around the generic sizing I’ve used/are offered by Tableau. I’ve definitely more to learn and develop in this area! Another thing I learned about Tableau is that you cannot combine shapes and colours as marks. True, there are work-arounds, but it is something that just feels like it should be native to the tool. Thankfully, I am not alone in this feeling and the idea is already on Tableau's community pages as a suggested future enhancement. While Tableau is a great tool for investigating geographical data – and I’ve used it many times for just this purpose – I feel unconvinced by its ability to function as a gazetteer of local services. It’s not that there’s anything inherently bad about it as a tool, just that traditional app development could probably deliver a better, more integrated, and fully-featured experience. The initial point of this exercise was to examine how useful the data is and it seems to me that not only do these individual datasets have value, but that value exceeds the sum of the parts when combined. It is clear that Belfast City Council has taken an important lead in this initiative. Beyond increasing the numbers of datasets they make available, I would urge them to consider (as I have outlined above) increasing the amount of information they include. Beyond this, I feel that careful thought should be given to standardising the format of the datasets across the organisation so that each uses the same basic columns and column headers so they may be integrated more easily. Outside of Belfast there is so much work to be done, but the initial steps have been taken in Fermanagh, Tyrone, and by Antrim and Newtownabbey Borough Council. What is needed is more data – robust, well-organised, reliable data … and more of it! Again, the same recommendation would apply as before, to adopt high quality standards that ensure clear, consistent datasets. Each of these .csv sheets is of little use on their own. It’s when they’re combined together with other similarly ‘slight’ resources they become worth more than the sums of their parts … what we have now is pretty good and could point the way for Belfast City Council or an Northern Ireland-wide project. While the presence of obvious geographic ‘holes’ in the data is usually a cause for dismay, here they should be viewed as opportunities for improvement! In discussing this project with Suzanne McLaughlin of OpenDataNI it was pointed out to me that I had accidentally omitted six sets of car park data. I’ve returned to the dataset and now added the missing 234 entries. The issues I described previously apply equally here, so I won’t labour the point. I will, however, mention two particular data issue. In the first case, somehow one of the co-ordinates in the Causeway Coast and Glens data got transposed into the Longitude column. When I attempted to batch reverse geocode these locations to get postcodes, I was surprised to find that Shore Street Car Park, Cushendall, had been mysteriously transported to Northern Kazakhstan. Even when attempting to use the given co-ordinates to get a Latitude and Longitude, I ended up with a dot on the map, approximately 100 miles north-west of Belmullet, Co. Mayo, far out in the North Atlantic. I eventually had to settle for a much less accurate location based on a best guess. The second data issue was associated with the dataset supplied by Derry City and Strabane District Council. Here, the street address, town, and postcode were concatenated into a single string (e.g. “Market Square, Claudy BT47 4AA”). While this may be human-readable, it limits its easy use in computerised systems. Although there were only 28 records, it took more a certain amount of time to split the whole out into usable pieces. My point here is not to belittle the efforts of any particular organisation for the data they’ve made available. Instead, it highlights the need for robust, accurate data provided in forms that are consistent and easily machine readable. 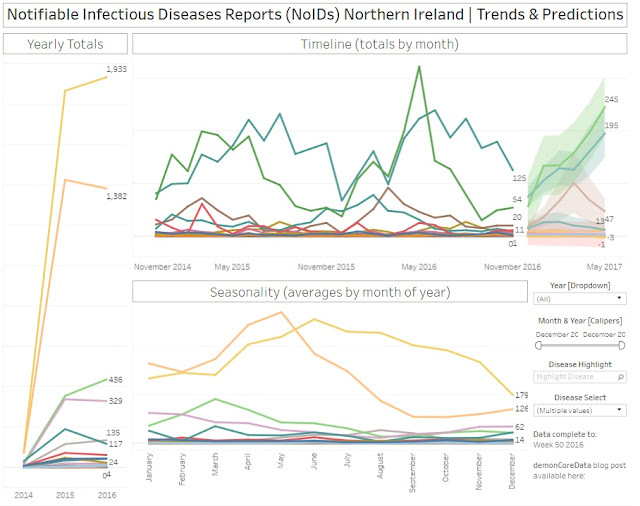 As an aside, I would also note that while issues like the incorrect location are difficult to spot in a datatable, they are abundantly clear as soon as that data is visualised!